The hiring process has several steps: finding out who's hiring, researching the application process, gathering all of your necessary documents, drafting a compelling resume and cover letter, interviewing, and undergoing a national security screening and a physical. After you've been accepted for a spot in a training class, you aren't hired until you successfully complete training, which means passing a variety of written tests with a score of 90 percent or better and a series of competency drills, including mock evacuations and medical procedures like CPR. Even though there are a lot of steps to go through before flying your first flight, they are rarely as intimidating or difficult as they seem at first. For instance, even though you might have to get a score of 90 percent or higher to pass, there may only be 15-20 questions of multiple choice, and you might have a few attempts to correctly answer the questions you get wrong. Also, the mock evacuations tend to be more like learning workshops, and if you make a mistake, you simply start all over again. Try not to get too stressed out about the process - it just takes patience, persistence and flexibility - exactly the skills you'll need to be a good flight attendant. 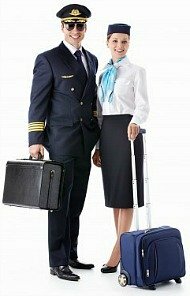 The Flight Attendant Hiring Process - While most of the day-to-day functions of a flight attendant are fairly routine, the high stress, high visibility and strict adherence to scheduled operations require quick thinking, ingenuity, calm and tact. A flight attendant's duties focus on safety and security, but the third component - friendly service - is what people expect most. Few travelers think of a plane ticket as just basic transportation from point A to point B. While the airlines have pretty much eliminated meals and luxury amenities, people do still want someone to get them a pillow or blanket. At the very least, customers expect someone to be warm and welcoming during a hectic boarding process, or show concern when someone is about to miss their connecting flight. While a high school diploma or equivalent is essential for every airline, larger and more established airlines prefer two or four years of college. At the majors, most flight attendant applicants have finished at least four years of college, and some have post-graduate degrees. It doesn't matter much what you studied, but the most frequently used skills on the plane are math (making change for liquor and headset sales, for instance, or counting the duty-free boutique cart inventory), reading (getting email updates, reviewing new procedures), and a little bit of writing, since a few times a year you will need to write incident reports on any medical emergencies, missing catering items or passenger misconduct. If you did public speaking in classes or as an extra-curricular activity (drama or debate), be sure to highlight that. And don't worry if your grades in school weren't so high, since the airlines usually just want to see a copy of a diploma.